A gateway between the East and West, Belgrade is a melting pot of cultures. Serbia's capital is one of the oldest cities in Europe with over 1.5 million inhabitants. The past and future merge in an unbelievable stream of energy. "The Sava here flows into the Danube," said 'Metropolitans' reporter Galina Polonskaya, travelling on a boat. "The city has stood at the crossroads of trade since ancient times. Now its famous for its magical effect on travellers." 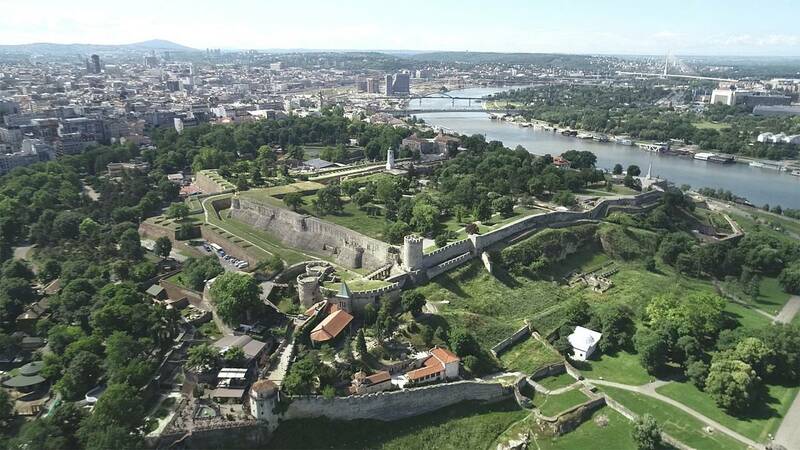 Visitors can plunge deep into the past while visiting the Belgrade fortress in Kalemegdan Park. The first fortified walls were erected at the confluence of the Sava and Danube by Celts in the 3rd century BC. Later it was conquered by the Romans. In total, the city-fortress was completely destroyed 44 times. "Kalemegdan is the heart of the city and you can really travel through history," said guide Milan Drobnjak, as he showed Galina around. "Here, you have the Roman part of the wall, you have the mediaeval Serbian part of the wall and right now we are walking at the Austro-Hungarian wall." Some 122 wars have been fought over Belgrade and its fortress through history. The military stronghold was used in both World Wars to defend the city. "Inside the Ruzica Church in Belgrade Fortress, we have chandeliers which are made out of weapons and they have a very deep meaning that a war should never happen again here in Belgrade," explained our guide Milan. Modernity looks at the past from the other side of the river with the 'Crystal at the Confluence' - the name some give to the Museum of Contemporary Art, built in the 1960s. After a decade of renovation, it reopened with an exhibition showcasing art created in Yugoslavia and in Serbia today. "It (exhibition) really wants to stress the importance of Yugoslav artistic heritage and that mixing of different culture and artistic codes which existed in what we call the Yugoslav artistic space," said the museum's curator Dejan Sretenovic. And comrade Tito was a big part of it! An official portrait of the President of the former Yugoslavia is at the heart of a brightly coloured creation by Serbian artist Dusan Otasevic, inspired by American pop-art. "The work itself is ambiguous in meaning. You cannot say is it an affirmation of Tito’s cult of personality in different artistic language or you can find ironic distance, so it’s still a question that we can pose today," said Dejan Sretenovic. Tito’s guests - presidents and prime-ministers - used to dine in Skadarlija, one of Belgrade's most beautiful streets. Some 400 metres long, it is famous for old restaurants, tireless musicians and a bohemian past. Famous Serbian writer Goran Gocic told us Skadarlija's story. "This used to be a gypsy quarter in the early 19th century and then, little by little, it became a bohemian quarter for Belgrade artists, like this guy, Djura Jaksic. He is a famous Serbian painter and writer who actually lived in this street in this house,” Gocic said, showing our reporter the residence in question. The 'Three Hats' restaurant opened in 1864 and Djura Jaksic used to spend evenings there with other famous writers, musicians and actors from the nearby national theatre, Skadarlija became the symbol of the soul of Belgrade, a city with a phenomenal power to inspire people. A source of inspiration to many architects, Belgrade’s Cooperative was built at the start of the 20th century. It was one of the first palaces in the city and remains one of its highlights. A hundred years ago, there was a bank, offices and luxury shops there. "It was a major task for architects to design, on a highly irregular foundation, a building meant to show the great power and security of the Belgrade Cooperative as an institution and the money invested in its bank," architect Aleksandra Sevic told us. The Cooperative Building is where the future of Belgrade is being showcased. The Belgrade Waterfront is one of the biggest real estate projects in Europe. It will have the largest shopping mall in the region, luxury hotels, offices and a world class residential offering. In total, it will bring 14,000 new inhabitants to live next to the Sava river. “The main idea behind this project is to reconnect people with the waterfront, so basically to revive this all neglected area right next to the waterfront and bring people as close as possible to the water itself,” explained Nikola Nedeljkovic, Belgrade Waterfront General Manager. Belgrade never sleeps and has exceptional nightlife. For travellers, locals and VIPs, there is a perfect place for everyone. DJ Nexie, who owns a nightclub, showed us one of the most popular party districts. “We are in Savamala. This is the main part of Belgrade for nightlife," said Nexie, real name Nemanja Tankosic. But what makes Belgrade nightlife different from party places elsewhere? For Nexie, it is clear. Belgrade parties seven days a week, all year round. It is just another thing to celebrate in the Serbian capital!